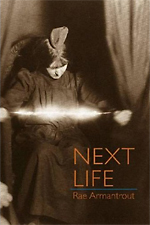 I wrote a little diddy about Rae Armantrout’s book NEXT LIFE. Back at school today but I have two good poems to post later for you. I hope you re-visit tonight. Or tomorrow. The next day? Next life? September 4th, 2007 at 9:11 pm eThoughtful stuff. September 5th, 2007 at 1:37 am eyou should write more reviews! September 5th, 2007 at 2:30 am eHmmm…that one was way too short for a review..heh. I see things ahead, mayhap. September 5th, 2007 at 2:31 am eOops…or, Amy should? September 5th, 2007 at 1:07 pm ejim I think you did not click on the link. it is very nice review. September 5th, 2007 at 2:03 pm eAmy’s? Yes, I did. September 5th, 2007 at 2:13 pm eApologies for the confusion. and the poetic education here. so I tend to assume great analysis up front. The earlier samples are handy to getting into this advanced stuff. …did I hear a few poems cookin’ , A.? September 6th, 2007 at 2:15 pm eSome new poems of hers in the September issue of Poetry. September 6th, 2007 at 5:06 pm eThanks for the comments, Jim and Didi. Printing out her “Poetics” statement now! And I’ll check out the new Poetry, Don – thanks for the tip! As for poems forthcoming, oh how I wish! September 6th, 2007 at 6:15 pm eYeah….RA has “Had” and “Fact” in “Poetry”…just picked it up! Border’s / Burlington MA has a few po. Journals on the rack.